The Anzick child genome: How Native Americans react to the oldest American burial. We’re trying to heal a wound between the scientific community and tribal communities. Shane Doyle, a member of the Crow tribe in Montana, was the first Native American to be told of the Anzick child’s 12,600-year-old genome and its implications. He is a Crow historian and an educator affiliated with Montana State University in Bozeman. 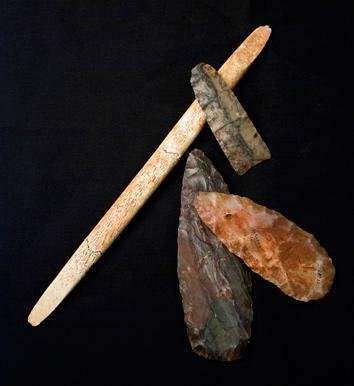 Tools found in the burial site of a 3-year-old boy who lived in Montana about 12,600 years ago and whose genome sequence was recently published. Catherine Brahic: How did you find out about the Anzick child? Shane Doyle: I was invited to the burial site last year, where Eske [Willerslev, who led the team sequencing the boy’s genome] told me about his findings. [See: “Ancestry of First Americans Revealed by a Boy’s Genome.“] It was overwhelming. I didn’t quite know what to say. I was overcome with emotion. I knew that it was going to be a landmark discovery, but I don’t think I realized how significant it was. I’m still wrapping my head around it. I can say my life hasn’t been the same since that day though. CB: In what way has your life changed? SD: For one thing, having that knowledge. As Indian people, we’ve always believed that we’ve always been here. But to have an intellectual sense of that really added to my sincere feeling that this is my homeland. I still am kind of in awe of it. My ancestors amaze me, really, all that they did and how they took care of that boy and his grave. I sang an honor song that day. There was a burial there that was disturbed. It was an accident, and now we’re trying to make it right, we’re trying to heal some of the stuff that has happened, we’re trying to heal that wound in the earth and the wound between the scientific community and tribal communities in America. CB: What does the burial site mean to you? SD: He’s kind of like a King Tut in a way. These people were hunter-gatherers. They had no agriculture, no disposable economy. Everything was important to them; their tools took hundreds of hours to produce. To put them all, that kind of wealth, in the grave of a [3-year-old] boy who wasn’t a pharaoh or anything … it is just too much for words. CB: What are you telling others about the finds? SD: My goal is that everyone learns about the story: not just the genetics, but also the amazing cultural artifacts. I feel a responsibility that more people should know about this. It’s a story probably every American should know. There are different ways to do that, but I’m an educator, so one of my goals is to turn this into a public school curriculum so students can find out about the scientific, historical, and cultural significance of it. CB: Where is the boy now? SD: He is in an undisclosed location, a safe place. Now the scientific paper is out, we’ll get feedback from other tribes, and maybe some will want to help with the reburial. His parents could never imagine how important he was going to be, and now I think we should put him back. CB: How have other Native Americans reacted? SD: Responses have been very measured. I don’t think the cultural significance has played out. Funnily enough I think that will happen when they see it in the papers and on TV. Our whole life experience has been: “You are not important, you have no culture, you’re cavemen.” So for them to get excited about scientific discoveries where science has in large part either ignored or neglected us … there’s a lot of mixed emotions. CB: There’s a rift between geneticists and Native Americans, who have been reluctant to have their DNA sequenced. Will this change? SD: I hope so. I don’t believe there’s anything wrong with genetic testing and I don’t think most Native Americans would either. What all of us agree on is that you should have respect for people who have been put in the ground. Eske’s message is that this work is not intended to be disrespectful.